When I was very young in the faith, I once went to volunteer at a ministry of direct service to the poor. As the priest in charge was introducing the work of the place, he asked a rhetorical question: "What's the problem with the poor?" Then he answered himself: "The problem with the poor is that they don't have enough money." We all laughed because it was so plain and obvious. But just as was the case with a lot of things that seemed plain and obvious when I was young in the faith, I was being formed in a doctrine without knowing it. The doctrine is that the primary issues to be addressed in the preferential option for the poor are material in nature. Therefore, work and ministry on behalf of the poor should focus on supplying for material needs or--as seems to be the style of our time--trying to compel secular government to supply them. In my optimism, as well as my upbringing in secular liberalism, I believed this doctrine. If we could arrange ourselves and the world such that the poor had enough to eat, adequate housing, opportunities for education and access to health care, their problems would be solved and we would be favorably received at the Judgment. I began to question this doctrine when I was working for a living in between my first and second time in religious formation. I worked in human services doing direct care, and I had many coworkers who were young women without a lot of resources. Nevertheless, they had jobs, homes, and access to health care. Over and over I noticed that it was not their lack of access to material resources but the chaos of their personal lives that kept them in a place of insecurity. Cycles of addiction and imprisonment in their families, and especially the way in which they would have to manage a range of husbands, boyfriends, and 'baby daddies,' as well as many other sorts of chaos seemed to keep these women from security in their jobs and peace in their minds. With these questionings of my earlier formation rolling around in my mind over the last few years, I was almost able to assent to Russ Reno in the latest issue of First Things: "A Christian who hopes to follow the teachings of Jesus needs to reckon with a singular fact about American poverty: Its deepest and most debilitating deficits are moral, not financial; the most serious deprivations are cultural, not economic." Almost. I have come around to believe that poverty is more a moral and cultural than a financial and economic problem, but only because morality and culture are logically prior to economic behavior and the practical arrangement of material needs in society. That Christians must serve the poor, even with a 'preferential option,' is a given. We should even expect and look forward to being judged on it. But what counts as helping the poor and the best way to serve become hard questions. Should our service concentrate on material, natural needs or on cultural and spiritual formation? More and more I realize that how I answer this question at this point in my life will decide what sort of Christian I will become in the future. But there is a twofold danger in this dilemma. It is not an 'either/or' at all, and we can't let our worldly politics drive us into such a reduction. If I happen to be a social conservative, I shouldn't imagine that I have served the poor in a full and coherent way just because I have worked to strengthen the culture of marriage and family and weakened the culture of contraception and abortion, for example, without also thinking about the immediate material needs of the poor. If I my worldly politics are liberal, I shouldn't imagine that I have fulfilled the whole of the gospel mandate just because I have worked and organized communities so that poor folks are fed, housed, and have access to education and health care. In the first case people are still hungry, and hungry people don't have time to think about lifting up their culture and addressing the spiritual poverties which so afflict the world in our time. In the second case, folks will find themselves unable to take advantage of benefits achieved because their lives and still chaotic and ungrounded. The answer is 'both/and.' We should neither try to preach to the poor without seeking to help them with their material needs, nor bracket off our faith in direct service, as if the faith itself weren't the best thing we have to offer people. And yet sometimes one encounters this, as if the faith and the Eucharist are things that send us out to serve, but stay at home themselves. On the contrary, the Eucharist is the best social program we have. Material, spiritual, and moral poverty don't necessarily imply each other, but they can easily reinforce each other when relationships, families, and neighborhoods spiral down into misery. The whole of the poor person needs to be served if we are going to fulfill the gospel, without any of the reductions provided by the politics of this world. 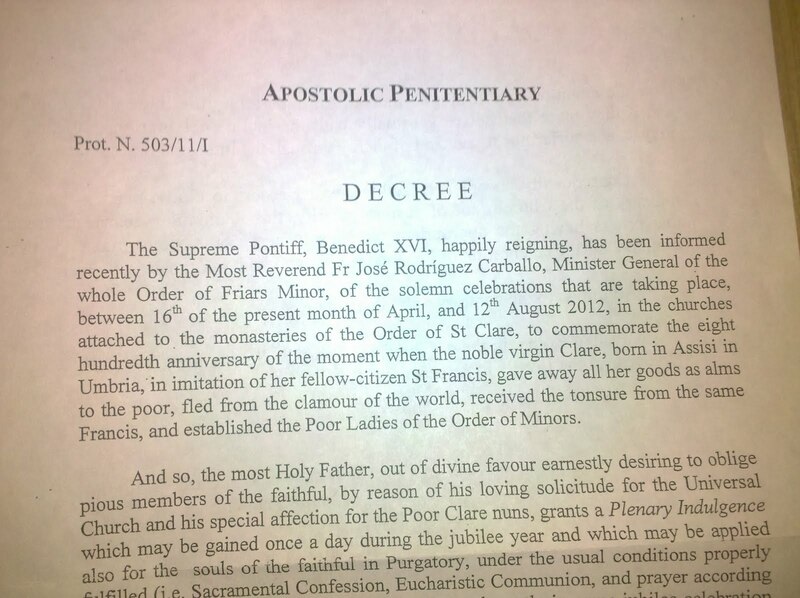 Arriving at the sacristy of the Poor Clares this morning, I was greeted by a copy of a decree from the Apostolic Penitentiary. I hadn't thought of this yet myself, but we find ourselves approaching the 800th anniversary of the tonsure of St. Clare. As goes the traditional calculation, on the eve of Palm Sunday in 1212, Clare ran away from her family, had Francis cut off her hair (you can go to Assisi and see it in a nice box), and thus began upon the circuitous path of her own religious life that led eventually to her being called the foundress of the Poor Ladies of San Damiano, the Second Order of St. Francis, the Order of St. Clare, the Poor Clares. 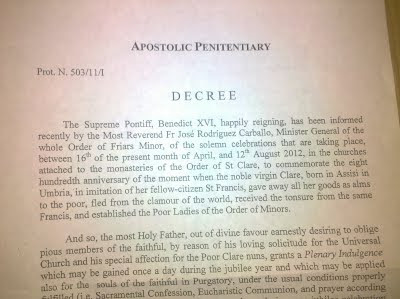 In celebration of all this, it seems that Benedict XVI has decreed that a plenary indulgence is available from this past April 16 all the way to after the feast of St. Clare next year, on August 12. The indulgence can be obtained, under the usual conditions of course, by visiting a Poor Clare monastery for some meditation or pious exercise, concluding at least with the recitation of the Our Father and a creed. It is also available for those who participate in any prayerful celebration of this anniversary. As usual, the indulgence can be kept for oneself or applied to the holy souls in purgatory, and is available once a day for the whole period mentioned above. Of course this is very exciting for me, as I visit the local Poor Clare monastery for Mass once or twice a week. The only thing I wonder about is the significance of the date of April 16. I would have expected it to be March 20, the traditional date of Clare's 'entrance' into religious life. The only thing I can think of is that April 16 is the old feast of the Profession of St. Francis. Other ideas? One of my joys over this past year back in Boston has been getting to know the "Schola Amicorum" which sings for the Sunday Mass in the Extraordinary Form at the cathedral. When I have been free, I have enjoyed their hospitality and the chance to learn to sing a little chant. I was there this morning. During a break from our practice (we rehearse in the bishops' crypt, which is just too cool) I was reflecting on why the old chants grab me so. That's when I noticed something funny within: Gregorian chant reminds me a little of the Misfits. I remember first hearing the Misfits when I was about fifteen. The whole thing caught me right away; the classic rock and roll song structures, the campy horror shtick, and especially the loopy, crooning vocals of Glenn Danzig and later on (in the reconstituted Misfits) Michale Graves. I've been singing along to Misfits songs for years. They are eminently singable. YouTube is full of kids covering them in garages and girls playing them on the ukelele. Really. Look for yourself. There are similarities with the chants for Mass: the looping phrases, the centering of phrases on long, drawn-out vowels, and the signature descending triads. I only bring up this very random connection to suggest how God prepares us remotely to minister to his glory. Long before I had any idea of even being a Christian, God was using this crazy music to form my singing heart, and to put into my own musical imagination a sense of tone and phrasing that He would one day put to work for divine worship. Several of the brothers have asked me if I have posted to the blog during these days of being away here at our provincial chapter. I haven't, but I thought I would put up this little post today just to check in. It's good to see all the brothers. Now that I've made my presentation on the revision of our statutes on Masses for the dead, I feel more relaxed. Today is our last day, which means the elections. So pray for us in our discernment as we go through the various ballots this morning, electing a Provincial Minister and four definitors to make up his council. Various other Capuchin bloggers are with me here: The always edifying and hilarious Mark of Just a Brother, who is presiding over the Chapter, the ever-encouraging Matts of New Sandals and Be Thou My Vision, and one of my favorite human beings, Richard of A Capuchin Journey. Check them out! Well, yesterday came and went, apparently without the arrival of Harold Camping's earthquakes and rapture. The world--and even some of us Christians, God help us--has a good laugh at the whole business, and we're done until next time. When we're all finished making fun, it seems to me that there are serious lessons to be learned from all this. First, this episode is a good example of why sacred Scripture has to be read from within the Church that produced it in the first place. As Dei Verbum teaches, Scripture and Tradition together form a single source of divine revelation. One cannot try to separate one from the other, as if the New Testament could be understood apart from the apostolic authority from which it comes. This is not to say that there is nothing new to be learned from Scripture. On the contrary, it is through the Scripture that the Holy Spirit wills to teach the freshness of the faith to each age. But it is also true that these understandings must be tested and checked against the apostolic authority from which the Scriptures came in the first place, sacramentally handed over down through the ages. To put it another way, anyone can pick up the Bible and find God, and they should. But 'finding God' in a personal way cannot be separated from being led into his Church, where his Spirit abides and his sacramental Presence remains. The 'rapture' depends on a very particular reading of Revelation and 1 Thessalonians among other books, and it is an interpretation that is quite apart from any sense we have in the apostolic Churches. And so in this episode we have the sad fruit of trying to read the Scripture outside of the Church: disappointment, wastes of time, personal resources and livelihoods, and the authority of the Scriptures themselves being mocked by the world. Third, we who are Christians should observe closely the next 'end of the world' craze when it arrives later next year. My guess is that the world will not laugh as hard as we approach the alleged Mayan end of the world on December 21, 2012. I'll bet that a lot of non-believing folks who mocked this would-be rapture will wonder seriously whether the Mayan thing is real. Why should this be? It can't be about antiquity; the claims of the Scriptures are older. Is it because one seems more exotic than the other, like in the Seinfeld episode in which George's mother is willing to take advice when she thinks it's from a Chinese woman, but rejects it when she finds out it's from 'some girl from Long Island'? Whatever the reason is, this whole sorry distraction, in which many people are now spiritually disappointed and in a situation of having wasted a lot of material resources, should be a call for all of us Christians to repent of how we have abused the authority of Scripture all the way to the point at which the very idea of its authority is a joke to the world. I had an interesting dream during the night, one that gives me both encouragement and warning in my vocation. As is very common in my dreams I was both looking for something and carrying some sort of container. This time I was carrying a pair of snowshoes covered in bees. I had the idea that the snowshoes were like the frames that fit into an artificial beehive, and I was searching around to put them back where they belonged. As is uncommon in my dreams, this search was indoors. I was in what I thought in the dream was one of our friaries, but I realize now that it was also Freeman Hall at Connecticut College, the basement of which I was living in during the fall semester of 1992. It's where I was living when I was baptized, received my first Holy Communion, and my Confirmation. My search in the building was cut short when I discovered a dead body partially entangled in a heavy curtain and put down the snowshoes to call 911. That's what I remember. I think I woke up after that. I think the snowshoes are my vocation; baptismal, religious, priestly, the whole thing. Snowshoes let someone journey safely over an otherwise impassible surface, and so it is with my vocation and the otherwise impassible road that is this world and my own life born into it. The snowshoes were covered with bees because my vocation is supposed to be something that is industrious and bearing of sweetness. But for that to happen, I have to search out how to make it work within the particular context of my religious life. I have to seek out where the snowshoes fit into the beehive that is somewhere in the friary. In this quest, I cannot be distracted by the works of death that tangle us up in the veil--that is, the flesh. I must care for those who come to be injured or even spiritually dead by them, myself included, but I can't be distracted from seeking how to make my own vocation fruitful with the industry and sweetness God wills from it. Today I'm hitting the road for a trip of about ten days. There are various stops, meetings, and the people to see, but the main thing is our provincial chapter, a meeting of the friars of my province that we have every three years. The last chapter, in 2008, brought big changes into my life when, in my first year of priesthood, my pastor was elected Minister Provincial. As always, I'll post when posts come to me. Comment moderation might be slow. Pray for us in your charity, that the Holy Spirit might guide our thoughts, discussions, and elections. Saying my prayers this morning I noticed that the little burn on the top of my left middle finger is almost healed. I got it on Holy Saturday. Sister sacristan had set up the thurible in such a way that the top was not lifted from the base on the stand, and it wasn't one of the ones that has some piece of less conductive material for grasping. So I knew as soon as I started to make my way over that I wouldn't be able to get incense onto the charcoal without burning myself. But the alternative--failing to incense the paschal candle at the beginning of the Easter Vigil--was unacceptable. Several times in the course of my Christianity I have gone through the Easter season with burns received at the Easter Vigil. One time when I was serving as acolyte (by privilege, not right) I got a pretty good burn on the back of my hand during the preparation of the candle. It only cleared up just at Pentecost. I was pretty proud of the timing. I'm grateful for these little reminders that the Christian life is supposed to set us on fire and consume us. "That you may become the brother of God and learn to know the Christ of the burnt men," said Thomas Merton at the end of The Seven Storey Mountain. "I don't want to die without a few scars," goes the line in Fight Club. The narrator says it in the book; I think Tyler says it in the movie. To desire to be a Christian is to accept, as St. Bonaventure put it, that "there is no way except through the burning love of the crucified." In Holy Communion we accept the broken Body of Christ into our bodies and our lives, receiving God's invitation to break ourselves in imitation of Christ. Many know the sacrifice of Christ by the breaking of their own bodies in the service and care of others. But all of us have to let our selfish will be broken. In the end, Christianity is a life of heartbreak. But it's not the hopeless heartbreak of the world, in which hearts break and close up into bitterness. Christians, seeing the suffering of the world, surrender to having their hearts break open into the expansive and inclusive love that is humanity's closest imitation of God. I've been reading on in Theodosius Foley's Spiritual Conferences on the Rule and Life of the Friars Minor Capuchin, and loving its richness and challenge. Today I thought I would share a little bit from the conference, "Personal Responsibility." Seventeen years later I now realize that there was some unconscious abdication of responsibility in me when I first came to religious life. Somewhere in my mixed motivations was the thought, 'O.k., now I'm all set. Religious life will provide me a well-regulated lifestyle, hold me fast in a life of prayer, protect me from distraction, and I'll finally be rid of my sins.' When you put it out so plainly, it's obvious how little sense it makes. Nevertheless, getting past the disappointment of this assumption being thwarted by reality is an important spiritual task for growing up in religious life, and finding an energetic spiritual strategy for taking responsibility for oneself instead is critical. Now that makes me pray for my conversion! Finding myself free of any obligation for Sunday Mass today, I decided to celebrate the appearance of Universae Ecclesiae by going to the EF Mass at the cathedral. Unfortunately, I wasn't there in time to assist from choir or sing in the schola, so I went to church as a morally absent priest. Oh well; if only such a thing were one of my more serious sins. Stopping by the Blessed Sacrament chapel to make my preparation for Mass, I started to think about the woman's request. Should I pray for her vocation, as she asked? If one accepts what the Church teaches, it can be said with confidence that this woman does not have a vocation to be a priest. So if I were to pray for her vocation, I thought, I would be praying for something quite apart from the intention she seemed to be asking, or imagined she was asking. But then I thought, isn't that the nature of all real prayer? In our distraction, false loves, and inordinate attachments, many times we don't have a clear picture of the graces we really need. What graces we pray for and what graces God delights to give us can be different things, though we can be sure we aren't too far off the mark if we strive to place our thoughts and imagination in clear, apostolic teaching. This is why real prayer always has the nature of surrender. It is the opening of the intention and affection to a Love and a Will that we can know, but which we cannot comprehend. To sit or kneel down to pray is to find the willingness to take a step on a path that is trusted, but unknown. And often God only shows us the very next step we are to take. Believe me, this is a manifestation of his Mercy. This is why prayer is a school of humility and an expression of evangelical poverty. Prayer is the perfect victory of our humanity displayed by Jesus himself, undoing the disobedience of our first parents in the garden: not my will, but yours be done. To ask someone else to pray for us is an even deeper surrender, an even greater degree of humility. In the intimacy of our own prayer, we can always shy away. We want to avoid the interior vertigo of letting go of ourselves and our own will, and because we don't trust in God, we can avoid prayer. Even worse, we can twist our pieties into a defense from God. In all of this, we have control. But if we ask someone else to pray for us, we have lost control. The grace God means for us is sought, whether it is the grace we think we wanted or even if we are trying to sneak away from God altogether in some way or other. So, having been led into this reflection, I decided to respond positively to the woman's request, and pray for her vocation. That she didn't, perhaps, know what she was asking, and now receives my little intercession perhaps against her aims doesn't matter. All prayer is like that anyway, to one degree or another. The document is supposed to be a clarification of how Summorum pontificum is applied. For me it answered one of my own questions, but left another in an even more mysterious condition. First, the question I feel is now somewhat clarified. SP 9,3 gives clerics the right to use the older Roman breviary to fulfill the Divine Office, for which the ordinary form is the Liturgy of the Hours. When I first read this, I was a new priest, and somewhat curious. I managed to find a complete 1962 Breviarium Romano-Seraphicum in the Capuchin use for what was--to me at least--a bargain (100 euro.) Using Fr. Hausmann's Learning the New Breviary (which you can download yourself here, note the Capuchin novitiate library stamp in the scanned copy) I started to experiment with the older form of the prayer. But I wondered about a couple of things. First, was it o.k. to mix and match? Could I just use the older breviary for certain of the hours? It was nice compact volume, and so eminently suited to carrying into the world. Could I just use it for the little hours during the day, i.e. for what would be Daytime Prayer in the LoH? Second, if I were to use the older breviary, did I have to say all the hours, or just the analogues of what appears in the current LoH? In other words, did I have to say Prime and all three of the little hours? It seems to me that UE answers these questions: 32. Art. 9 § 3 of the Motu Proprio Summorum Pontificum gives clerics the faculty to use the Breviarium Romanum in effect in 1962, which is to be prayed entirely and in the Latin language. This language suggests to me that 'mixing and matching' is not the idea, and that one using the older breviary is supposed to pray all of it. My second question is about the celebration of Mass alone, and about it I'm still confused. According to current law, it is possible to celebrate Mass without even another minister or server, for a just cause. The devotion of the priest or his desire to offer Mass is considered a just cause in this regard. This a relaxation of the former law that would have been in effect in 1962, in which it was far more difficult, and even impossible, to justify offering Mass alone. Towards this question, UE reitereates SP: 23. The faculty to celebrate sine populo (or with the participation of only one minister) in the forma extraordinaria of the Roman Rite is given by the Motu Proprio to all priests, whether secular or religious (cf. Motu Proprio Summorum Pontificum, art. 2). For such celebrations therefore, priests, by provision of the Motu Proprio Summorum Pontificum, do not require any special permission from their Ordinaries or superiors. Sine populo, "without the people," does not mean 'by yourself.' It just means off any public schedule, without the assistance of an assembly. It does not mean 'without a server' or 'one other minister' as the missal in the Ordinary Form puts it. Now it seems to me that the relaxation given in current law that enables one to offer Mass alone is sometimes imported into the EF (along with some other convenient modern rubrics, like the right to offer Mass at any time of day, for example.) The excellent FSSP training video for the older form of Mass even has a section on how to make adjustments to the Mass when it is offered alone, without even a server or some other person to make the responses. That would seem to suggest that such a thing was allowed! I've never been sure about this, and after UE I feel even less so: 28. Furthermore, by virtue of its character of special law, within its own area, the Motu Proprio Summorum Pontificum derogates from those provisions of law, connected with the sacred Rites, promulgated from 1962 onwards and incompatible with the rubrics of the liturgical books in effect in 1962. It would seem to me that the relaxation of being able to offer Mass alone, without even a server or someone to make the responses, is such a provision promulgated after 1962 and incompatible with the EF rubrics as they stand on their own. Now I'm neither a liturgist or a canonist, and a dilettante when it comes to the EF for sure, but so it seems to me. From time to time Providence arranges for me an experience to remind that me that whatever the troubles, sufferings, doubts and sorts of loneliness I unknowingly bought for myself when I trotted out of the basement of Freeman Hall in my combat boots and blue tie, walked down Williams St. to Our Lady of Perpetual Help in Quaker Hill and got myself baptized, I could never go back to the world. The other night I went down to the friary TV room to hang out with the assembled brethren. An interview show was on, and the great interviewer was talking to a celebrity. The interview was very striking to me in a couple of ways. First, it was clear to me that they had nothing to talk about. They kind of just sat there, toying with another, jabbing and making fun, in a way that might have been playful at least had it not been so joyless. So let's pray for everyone, Christians and otherwise, who live the joylessness of the world. And let us thank God for the reminders he gives us of the salvation we have received in Christ. 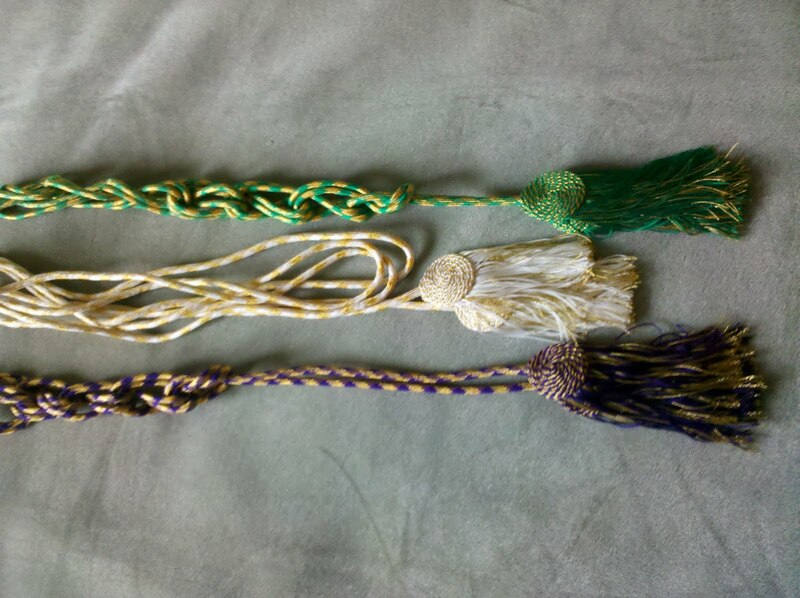 I received these lovely cinctures in the mail today, a gift from Paul of the Communio blog, which you should also read. 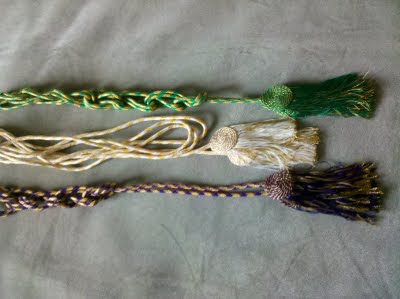 "Salimbene, recounting the lack of discipline in the Order in his youth, remarks: 'Some of these brethren did not even wear the proper cord of the friars, but chose a fancy one with colored threads and intricate knots. And happy was he who thought he had the prettiest one." Fr. Guardian left this morning for the meeting of our "admissions board" tomorrow. This is the group of friars who consider the applicants presented by the vocation office and decide who will be recommended for admission to postulancy to the Order. In your charity, as you are able, I ask your prayers for the work of the Holy Spirit in this meeting, and for those who are being considered. The planning of funeral liturgies is a favorite complaining point for us clergy. Inappropriate music choices, trite or vulgar eulogies, and the general assumption that funerals are 'celebrations of life' rather than sacrifice and intercession made on behalf of the dead, all of these--and more--get to be sore points between the faithful and their priests. I dealt with these things many times as a parish priest. I hated having to always go into a liturgy nervous about what crazy thing people might try to do, and struggled with temptations to indulge disdain for the people, I confess. Having been out of parish work for almost a year, the distance has given me some perspective on these questions. The more I think about it, the more I come around to the assertion that it is the clergy who are to be blamed for these things, not the people. First, eulogies. I have groaned inside as I have heard the dead disrespected with tacky stories. I have squirmed in the presider's chair as I heard drinking stories proclaimed in church. I'm sure many mourners and celebrants can relate. But here's the thing: as long as celebrities and politicians are allowed to have eulogies at their funeral Masses, you can't tell regular folks that they can't. If Barack Obama can get up in front of the Blessed Sacrament and praise Ted Kennedy, that means that someone can get up and talk about grandma's meatballs or uncle so-and-so's drunken misadventures. It's only fair, folks. Second, music. Once folks get the idea that they need to hear some corny or secular song at the funeral of their loved one, it can be very difficult to find a way out of it. Policies help, but like so many things, there's some priest somewhere who allowed it, and therefore everyone else has a right to it. Again, the people aren't the problem, but the underlying assumption--embraced by most clergy--that the way one gets music into the liturgy is by 'picking songs.' A lot of priests have no more formal training or artistic sense than the average lay person (and sometimes less) and yet priests reserve the right to pick songs for Mass based on their tastes and 'themes.' Sorry, just because OCP or GIA publishes a piece of music doesn't mean that it is automatically appropriate for liturgy either. So, as long as we accept without question that the ordinary texts of the Mass are to replaced with songs and hymns that we have the right to pick and choose according to our own tastes and 'themes,' we can't tell the people they can't do the same thing, according to the 'theme' they imagine is important to them. So, priests, if you don't want people demanding silly or inappropriate music for funerals (and weddings for that matter) just undermine the whole assumption and tell the people (and yourself) that the music doesn't have to be picked in the first place because it's already there in the Missal and the Gradual. And yes, there are English versions of the Gradual, even for free! Finally, preaching. The homily is one of those places where the whole 'celebration of life' problem comes into focus. People want a homily that 'makes it personal.' Not that this isn't possible with a principal emphasis on the paschal mystery and Christian hope, but often these things, which ought to be primary, fall to a secondary place at best. In other words, many times folks presume that the homily ought to be a eulogy, and are sometimes annoyed when they get the former. But again, here's the thing: most of the funerals I've been to for priests and religious have been the same thing, and sometimes even more outrageously so. Therefore, reverend fathers, if we want to undermine the encroachment of the 'celebration of life' model, we have to start with ourselves. It was my good fortune to have Mass at the Poor Clares this morning, because today is the feast of St. Catherine of Bologna. You see, for some reason or other she seems to have fallen off our calendar, but remains for the Poor Clares. So at the Capuchin friary, as best I can tell, today is Monday of the third week of Easter, but at the Poor Clare monastery, it's the memorial of St. Catherine. As I wrote about once before, I'm always fascinated by the selection from Catherine's Treatise on the Seven Spiritual Weapons that appears in her Office of Readings. I love how the first of her "weapons" is diligence. I preached on this for the Mass, and the sister who was putting things away after Mass struck up a conversation about it. We talked about how diligence has a root in the Latin verb lego, 'to collect' or 'to pick out.' It is in this sense that lego also means 'to read;' reading is an act of picking out words from a page. Sister said that "after 57 years in the monastery" this was the principal spiritual challenge: not to just live "by the bells" or by the schedule, but to do all of those daily things in a collected way, really picking them out, really choosing to do them without being somewhere else in thought or attention. This is one of the most basic things in the spiritual life; the spirit of age quod agis, to 'do what you are doing.' To really listen when someone is speaking, resisting the temptation to use the moment to think about what you want to say next, to pay attention to the activity at hand without thinking about what has to be done next, etc. The Incarnation teaches us that it is both God's desire and his style to be revealed in the plain, the ordinary, the unglamorous. By our attention to what comes before us in the present moment, we will find Him there. Many devout people live from time to time in a state anguished confusion because of habitual sins and faults. They find it hard to see a path to freedom from these things. In some ways it's not their fault; overcoming sin and striving for perfection aren't preached or taught about much. Often part of the problem is the false assumption that the best way to overcome the fault or the sin is to resolve to 'stop doing x.' Sometimes this can work, but usually it doesn't. A much better strategy is look at the rest of one's life to eliminate the occasions of the sin and the subtle consents to what leads to it. For example, if we struggle with distraction in prayer beyond any fruitful use, it's probably because we live in a distracted way the rest of the time too. When we try to live a more intentional and less distracted life generally, we will find our specific time for prayer less distracted as well. Someone may surprise himself when he is suddenly overcome by anger, expresses it in speech, and is then sorry for what he said. It doesn't do much good to say, 'I won't get angry next time.' Better to begin to examine all of the little ways he consented to interior movements of anger, impatience, and self-righteousness before what seemed like a more serious incident occurred. The same sort of thing goes for chastity. Someone should not be surprised to find himself or herself having fallen into a grave act of unchastity when he or she has been consenting to small, interior acts of selfishness and consenting to little movements of lust all along. And yet, because we often don't examine ourselves and attend to our thoughts and feelings as they arise, we are surprised and don't understand when we fall into serious sin. Any recovering addict will tell you that a slip into picking up the drug of choice is consented to in the will long before the actual incident. "As habits are made up of single acts, so our character is formed by our habits, and character is what influences our destiny here below and hereafter. A war is not won by superb action at the time of crisis, but by foregoing training. Our conduct in the less struggles of life determines how we shall act in the heat of battle." Any scholarly drivenness I might have--and I have precious little, unfortunately--clusters around my desire to know what it means to have a Franciscan approach. What is a Franciscan theology? A Franciscan pastoral stance? Commonplaces abound, but I have never arrived at a rigorous and satisfying account. But since it's Friday and it's late, it's better just to tell funny stories from various points along the maladventure of this personal quest. As Dean Ween put it, "When it's time for bed you shouldn't think about that stuff." In between my religious lives I had a bumper sticker on my car that said, "Perfect Joy Is Being Franciscan." (I removed it before going to my first interview with the Capuchins, for fear of appearing presumptuous.) One time a lady on the street questioned me about it. "Perfect joy is being Franciscan? Franciscan...is that related to the Melchizedekian priesthood?" A lady on the subway asked me if I was a Franciscan. I said that I was. "What's the Franciscan position on the three and a half year period prophesied in Daniel?" A man carrying a large amount of art supplies intervened in a conversation I was having with a young woman who was a religion student at BU. She had thought I was a Jesuit. "He's a Franciscan. Jesuits read books, Franciscans talk to birds." A man was telling me about how his dog had died. "Now the Franciscan position is that dogs have immortal souls, right?" I've finally gotten around to reading one of the classics of American Capuchin literature, Theodosius Foley's Spiritual Conferences on the Rule and Life of the Friars Minor Capuchin. Don't look too hard for it; I don't think it was ever published outside of the Order. It seems so plausible to live as everyone else is living, to enjoy our inborn liberties of choice and action without inhibitions, to possess what others have--home, friends, comforts, and the good things of this life. The world will always seduce us with its loose principles, its gaiety, its luxury and cult of the body. It is a formidable opponent of the friar in his otherworldly way of life. It entices him constantly to conform to its spirit, to its habits, and customs. And how many yield to its promptings in so many devious ways! Why should we friars ape the style and customs of the world, which we have solemnly renounced? Can we be Franciscan followers of Christ and yet consort with worldlings, use their language and frequent their haunts? We want both the good things of Christ and of the world, but draw back from the burdens of either. We enjoy to the full the temporal advantages of the religious life, and obtain economic security, but we omit to fulfill the condition of such blessings, namely, to "seek the Kingdom of God in the first place." We can have either the advantages and burdens of the world, or the cloister--be religious or not. But to seek the advantages of both world and religion at the same time and elude the burdens of either is tempting God. In religious life we tend to have the powdered sort of laundry soap, the kind that comes in a big box. In the box comes a little plastic scoop by which you are supposed to measure the soap into your wash. Here's the rule of religious life: when the box becomes empty, it is thrown out, burned, or recycled, depending on local law or custom. The plastic scoop, however, may not be thrown out, but must be placed into the next, newly opened box of soap. Never mind that the new box comes equipped with its own scoop. Now it will have two. When this box is empty, its two scoops are transferred to the next new box, which will then have three. And so on. I have observed the results of the careful observance of these procedures in every friary to which I have ever been assigned. I don't know how to process is interrupted, but I have seen as many as six scoops in one box of soap. Jesus' conversation with Nicodemus in John 3 comes around as the gospel for today. I can remember puzzling over these words when I was younger in the faith. I needed time; their meaning could only be revealed to me in the course of the journey. Over the years this passage has become so dear to me that now it's my current choice for the gospel at my funeral Mass. I imagine that anyone whom God has invited into a devout life has asked the question of God, 'Why me?' Why do I have the grace of the mercy of this vocation, the gift of this invitation to consecrated life, the joy of the priesthood? As time goes on I have less and less of anything that could be called an answer to this question. The wind of the Spirit, I don't know where it came from. Nor do I know where it's going. For the convert, God always remains something of an adventititous character; in the poverty of our spiritual vision He seems to have shown up at a certain moment with a freshness that doesn't seem to fade. The journey, analogously, retains its experimental character; it is a journey of discovery, of the rediscovery that makes itself present to us as revelation. Where is the wind of the Spirit blowing? I don't know. I don't know how to diagnose the ills of the Church. I don't know what the Order is supposed to do next, and I don't know what I'm supposed to do with this degree that I'm working on, or if I will even be able to complete it. But this isn't the important thing. Jesus says, "you do not know...where it goes." What matters is that we can hear the sound of the wind in the present moment. Jesus assures us of this; we can hear the sound that the Spirit makes. What else is this but prayer? What is prayer but the opening of the heart and mind so that the Spirit may breeze through and become the Breath of God breathing in us? The Spirit blows where it wills, and I don't know where it came from or where it's going. But I don't need to know these things. All I need is to break open my selfish heart and let go of my distracted mind so that the wind of the Spirit might have a chance to breathe freely in me. If I can hear the sound of that happening, even if it be ever so obscure or faint, that's all I need.